– Dinner is served in the restaurant or outdoor dining area if the weather is permitted, which is a gastronomic delight. After dinner, unwind in the bar where there is a selection of books, magazines and board games or watch a movie on our plasma TV; join some of our team to go cuttle fishing at night. Accommodation and overnight on junk. – Transfer to smaller boat to explore Day and Night cave and pearl farm. Guided kayaking, swimming, a pristine natural cave lapped by the turquoise water. – For the early risers join us for a Tai Chi session on the sun deck. – After breakfast, we sail through the waters and pass by a number of caves and we drop anchor at Surprising (Sung Sot) Cave. 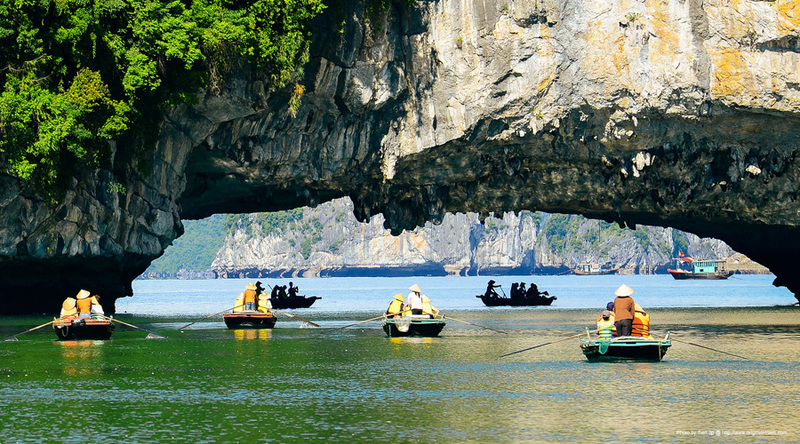 grottoes in Ha Long Bay with thousands of stalactites and stalagmites. – Return to the shore and disembark from The Carina as our crew say farewell. – Transfer to minibus or private and return to Hanoi.